In his defence, Scholes was simply being honest about a club that he undoubtedly holds close to his heart, and perhaps was speaking as a fan more than anything. Results and performances under Mourinho undoubtedly left the Portuguese tactician open to that criticism, prior to his departure from Old Trafford in December. 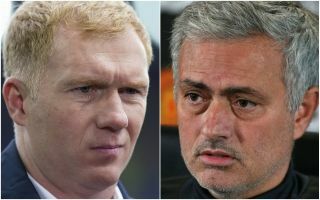 However, Scholes expects Mourinho to take his chance to respond if results aren’t going well at Oldham, but insists that they won’t bother him as he won’t take much notice of what pundits in general say about his tenure at the club. “I think he will be watching results,” Scholes said, as per ESPN. “Whether he will be watching the games I am not too sure. I don’t think we will get many pundits watching — [although] if we are losing games I am sure people will be popping up — [they] can say what they want. Time will tell whether or not the 44-year-old is a success on the bench, but given the experience that he accumulated as a player and the knowledge that he would have gained from Sir Alex Ferguson, it does set up an intriguing experience at Oldham.